The beginning of the new year is not the end of the holiday season in Sweden. No, the Swedes also get to take off work on Epiphany – January 6 - just a few short days after the end of the Christmas break. Lucky Scandinavians. Some secular Swedes want to throw off their Christian heritage, though, and are urging the government to do away with this celebration as a paid public holiday. Sweden is one of the very few countries that gives public honor to Epiphany, and many Christians these days don't even know what this holiday - celebrated 12 days after Christmas - is all about. Almega, a Swedish employer's organization, wants the government to quit forcing employers to pay their employees for taking off work on Epiphany. Almega isn't really picking on Epiphany, though. The group wants to do away with all religiously-based public holidays in Sweden. "That means that employers and their employees can reach an agreement about which days will be considered a paid holiday," Almega negotiator Gunnar Järsjö told the TT news agency. Not everybody agrees with Almega, and the issue has raised public debate in Sweden. "It's a time to focus on the guiding star and the three men who out of curiosity followed the star to Jesus," Martin Modeús of the Church of Sweden told TT. While Sweden fusses over the relevance of Epiphany, a dwindling number of Christians know what the day is about. Even Modeús is missing the significance of the holiday. Epiphany celebrates the arrival of the Magi who traveled across the known world to pay homage to the young King of the Jews. They came out of more than mere curiosity. While we don't know the exact date of their arrival, their journey must have begun months, perhaps years before they reached Mary and Joseph's new home in Bethlehem. They also brought with them gifts that bore powerful prophetic significance; gold reflected the kingship of Jesus the Messiah; frankincense was a spice used in the priestly duties; and myrrh was an embalming ointment that signified Jesus' death. 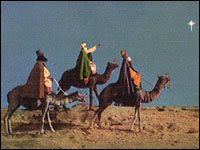 The Magi also hold the honor of being the first gentiles known to have come to worship Jesus. The Messiah was born in Bethlehem to the Jewish people, but He came to be the Savior and Lord of all nations. Straight No Chaser, the men's acapella group at Indiana University, does a unique and entertaining version of The 12 Days of Christmas that has been all the rage on Youtube for a couple of years now. We know the song better than we might want to. What many people don't realize is that the 12 Days of Christmas actually begin at Christmas. During centuries past, these were 12 days of celebration that were filled with feasting and gift-giving until the Twelfth Night – the evening of January 5th - the day before Epiphany. Orthodox Christians celebrate Epiphany with another focus; Christ's baptism by John the Baptist. Epiphany, which means "to manifest" or "to show" in Greek, is often also called Theophany by the Eastern Church, because it is Christ's presentation to the world as the Son of God. All these traditions and celebrations point to a very important truth - that the Son of God came to Earth. The Wise Men and the meek of the earth recognized and worshiped Him. May we continue to worship and serve Him every day of this new year and present to the world the reality of His Life through our own.